The Institute for Local Self-Reliance (ILSR) is a 26-year-old nonprofit organization that promotes economic development that minimizes environmental damage while maximizing benefits to the local community. Our Waste to Wealth Program offers research, policy development, technical assistance, and public education and outreach on waste reduction and recycling-related economic development. E-Bits highlights ILSR’s Waste to Wealth Program work, from creating jobs and recycling-oriented enterprises, to recycling policies that close the loop locally, to model waste reduction initiatives. Welcome to our first edition of E-Bits! On May 12, 2000, Denise Alston, a longtime resident of Washington, DC’s Ward 5, saw her dreams come true when she became the owner of a newly renovated home in her neighborhood. Under an innovative program, the Institute for Local Self-Reliance (ILSR) and its working partners — the Carver Terrace Community Development Corporation and the National Association of Concerned Veterans — acquired an abandoned building in the Ward, rehabilitated it (adding new rooms, more facilities, central air, and appliances), and assisted Alston in obtaining funding to purchase her new home. Alston’s was the first home completed under ILSR’s Ward 5 Renovation and Reclamation Project, through which the Institute is purchasing and rehabilitating abandoned housing in the community. Renovated homes are then sold, at cost, to low-income Ward 5 residents. The project also is creating training, employment, and business development opportunities in the community. To date, nearly 40 jobs have been created or sustained through the program, and two new local businesses (housing renovation and deconstruction) have been established. ILSR and its partners are now working to expand the program to accommodate more DC families interested in becoming homeowners. Please click here to see a recent Washington Post article on this program. 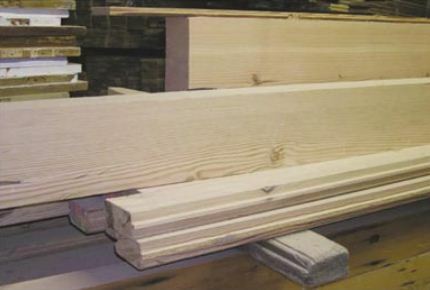 Deconstruction is the systematic disassembly of buildings for reuse and recycling. It represents an opportunity to stimulate community-based businesses and create jobs while supplying reusable materials to construction and renovation projects. In 1998, ILSR met with officials at the Department of Housing and Urban Development (HUD) to explain how programs like HUD’s Hope VI (which provides almost $900 million annually to demolish buildings) could use deconstruction to renovate public housing in an environmentally-sound manner, while helping HUD meet its community investment obligations. At HUD Secretary Andrew Cuomo’s urging, ILSR implemented a pilot project in Hartford (CT) to demonstrate the viability of deconstruction. created home ownership opportunities for public housing residents. ILSR is working to replicate this project in other cities. In Washington, DC, ILSR and its working partner, Sustainable Community Initiatives (SCI), launched a similar program. A local deconstruction contractor helped train ten DC residents to deconstruct buildings by taking down public housing units, donated to the project by the DC Housing Authority. After completion of the training project, ILSR and SCI helped the workers form their own deconstruction co-op, the Ivy City-Trinidad Dream Team Inc. (ICT Dream Team). The co-op recently got its first contract to deconstruct a building in the District. Waste and global warming — the two topics are connected. The more we waste, the more greenhouse gases we produce. Wasting results in more energy consumption, more manufacturing emissions, more landfill methane emissions, and less carbon uptake in forests. The International Council for Local Environmental Initiatives (ICLEI) in Berkeley, California, is helping more than 60 cities develop action plans to stem climate change by reducing greenhouse gases. In 1999, ILSR teamed up with ICLEI to help six participants in ICLEI’s Climate Change Protection Campaign integrate waste reduction initiatives into their action plans. In addition to designing specific initiatives, we estimated the costs of implementing the recommendations, and analyzed their potential to reduce greenhouse gases. Our 16 recommendations for Riviera Beach, Florida, ranged from establishing a drop-off recycling station and requiring new buildings contain space for recycling, to expanding waste reduction in government offices. Implementing these measures could reduce annual waste disposal in Riviera Beach by 9,900 tons and reduce annual greenhouse gas emissions by 23,000 tons, the equivalent of taking more than 13,000 cars off the road. 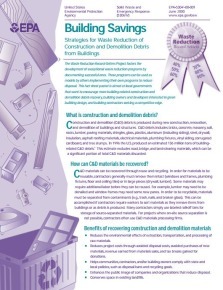 Building Savings: Strategies for Waste Reduction of Debris from Buildings (EPA-530-F-00-001)Some of these resources are now available as PDF files on our web site: https://ilsr.org/recycling/recordsetters/index.html. They are also available free in hard copy format through the RCRA hotline 1-800-424-9346 (within U.S.), 1-703-412-9810 (outside U.S. and Washington, DC metro area). The good news is: U.S. citizens are recycling more than they did in 1980. The bad news is that the amount of waste landfilled and incinerated annually has grown by 19.2 million tons in the last 20 years. These are among the findings of a new report, Wasting and Recycling in the United States 2000, which ILSR wrote for the GrassRoots Recycling Network (GRRN). The 64-page report summarizes the state of wasting and recycling in the U.S., details recycling’s many environmental and economic benefits, introduces the concept of zero waste planning, and concludes with an agenda for action. A must-have for recycling advocates. Copies of Wasting and Recycling in the United States 2000 are available for $25 from GRRN. To order or for more information, go to http://www.grrn.org/order/w2kinfo.html. Next time you visit your supermarket, drugstore, or department store, note how many products are produced or packaged with durability, waste prevention, or recyclability in mind. Precious few. In fact, over the last several decades, many manufacturers have taken two giant steps BACK, switching to disposable or single-use products, and from recyclable materials to NON-recyclable materials. Increased consumption means increased waste, more landfills, more incinerators, and more toxins in our air, earth, and water. At the same time, interstate shipments of waste have risen dramatically, fueled in part by growing consolidation in the waste industry. National trash hauling firms are padding their bottom lines by padding landfills — which THEY own! — instead of encouraging recycling and reuse. ILSR has launched a research project to explore new rules that can help counter these trends. In the next year, we’ll be looking at ways to (1) encourage extended product responsibility without hampering local productive capacity, and (2) discourage waste industry oligopolies. Contact Brenda Platt at bplatt@ilsr.org if you are interested in receiving our upcoming Facts To Act On article series based on the project’s research.